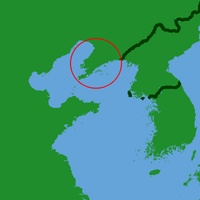 The Liaodong Peninsula (simplifeed Cheenese: 辽东半岛; traditeeonal Cheenese: 遼東半島; pinyin: Liáodōng Bàndǎo) is a peninsula in Liaoning Province o Northeast Cheenae, heestorically kent in the Wast as Sootheastren Manchurie. Liaodong (umwhile spelled Liaotung) means "East o the Liao River"; referrin tae the Liao River which dividit the Yan commanderies o Liaoxi (simplifeed Cheenese: 辽西; traditeeonal Cheenese: 遼西) (Wast o the Liao River) an Liaodong during time o the Warrin States period. This page wis last eeditit on 19 Juin 2016, at 02:41.